In Budget 2015 the Finance Minister allocated $3 billion towards the construction of the new Terminal 5 at Changi Airport. He stated that he would be setting up a new fund, the Changi Airport Development Fund (CADF). The Transport Minister subsequently explained in a debate in Parliament on 11 March 2015 that this was just a downpayment and that the eventual cost would be many times more. I have written more about the Finance Minister’s fondness for padding the Budget with allocations to new funds. These keep springing up like weeds. I have argued in “Smoke and Mirrors in the Government’s Accounts” and “How to Make A Surplus Disappear Without Anyone Noticing” that their purpose is to make current spending look higher than it is and prevent Temasek, GIC or MAS having to actually pay out the Net Investment Returns Contributions (NIRC). They are part of a circular closed system that prevents Singaporeans knowing the true state of the reserves. Once money is allocated to a fund Parliamentary accountability disappears since only the Finance Minister scrutinises the Fund’s spending. The Finance Minister is supposed to lay the fund’s accounts before Parliament but there is no evidence that any time is allocated in Parliament to discuss the performance of the funds. My concern with the Changi Airport Development Fund is more specific. In 2009 the Government corporatized Changi Airport Group (CAG) through an Act of Parliament transferring it from the Civil Aviation Authority of Singapore in return for a capital injection valuing the CAG at $3.2 billion. 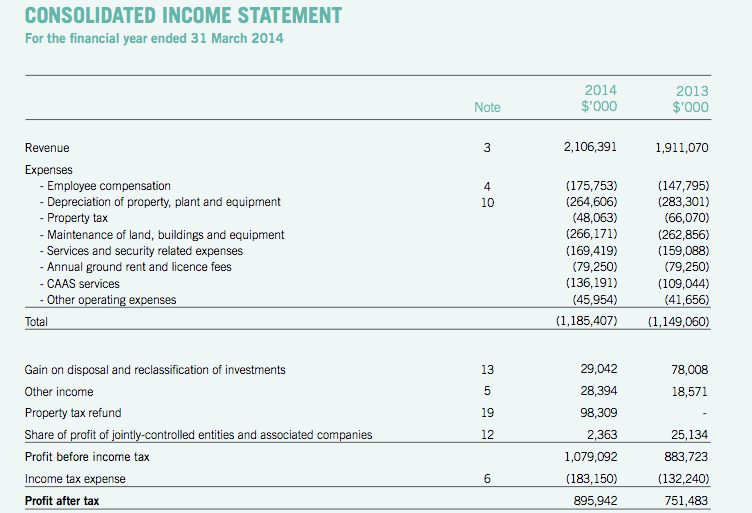 Looking at Changi Airport Group’s latest accounts for the year ending 31 March 2014 (see below) Earnings Before Interest Tax Depreciation and Amortization (EBITDA) was $1.34 billion. Putting that on an Enterprise Value to EBITDA multiple of 20 times (not unreasonable in the current low interest environment) would value CAG at $27 billion. Not a bad return considering that when MOF transferred CAG it also included $1.09 billion cash on the balance sheet so the true cost was around $2.1 billion. The Ministry of Finance (MOF) currently still owns CAG. Such a valuable asset should be included in the Net Investment Returns Framework and also be accounted for in the Statement of Assets and Liabilities (SAL) of Singapore, which the Finance Minister is obliged to publish every year with the Budget. There are no notes to the SAL so it is not clear whether it includes CAG just as it is not clear whether it includes Temasek’s assets. However legally all assets owned by the Government should be included. That should include Temasek, GIC, MAS, CAG, CAAS, land sales receipts as well as the freehold interest in 80% of Singapore’s land owned by the Government. The taxpayer is also losing out because it is not included in the NIRC, which is defined under Article 144 of the Constitution to be the returns from GIC, Temasek and MAS even though the Government is funding the development of CAG out of taxpayer monies. Lui Tuck Yew said that Terminal 5 would have an initial capacity of 50 million passengers a year and an eventual capacity of more than all the current terminals put together. That means it could easily double CAG’s EBITDA and raise its potential value to greater than $50 billion. If the taxpayer is paying for the construction of Terminal 5 but the asset is owned by CAG or subsequently transferred to them for a nominal sum then whoever owns CAG will reap a huge gain perhaps even exceeding what it has made on the original transfer of Changi Airport. The Transport Minister failed to disclose the terms under which Changi Airport Development Fund will operate and how the taxpayer will be paid back. Under the Constitution, there must also be an Act of Parliament setting up CADF and its existence must be disclosed in the SAL. At some point in the future the PAP Government clearly intends to sell or transfer CAG to another company. 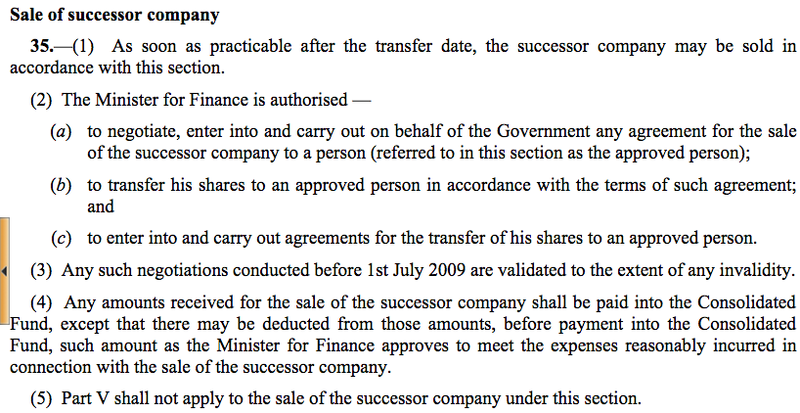 Article 35 of the Civil Aviation Authority of Singapore Act states that as soon as practicable after the transfer date the successor company (CAG) may be sold in accordance with Article 35 (see below). Presumably the likeliest buyer is Temasek. If CAG, which also manages foreign airports, is sold, whether to Temasek or to a foreign company or private equity firm, then the Finance Minister must ensure that this is an open auction in which the taxpayer receives full value for money. This would be true in any event and particularly the Government is getting the taxpayer to fund the new terminal. The Government must also disclose any bonuses paid to the management of CAG and to any subsequent role for the former management with a new company because of the potential conflict of interest. The Chairman of CAG, Liew Mun Leong, a former civil servant, was formerly the head of CapitaLand Group, formerly wholly owned by Temasek and still 39% owned, was paid a $20 million bonus in just one year by his boss, Ho Ching, It was shocking to many Singaporeans at the time that a former civil servant could be paid so much when before joining CapitaLand he had been a loyal apparatchik of the Government. The CEO was formerly with the RSAF and apart from that his principal qualification seems to have been as Principal Private Secretary to Lee Kuan Yew. Many of the board members also have a role with Temasek so the connection with Temasek is pretty close, incestuous even. Temasek’s management, and in particular Ho Ching, the PM’s wife, are paid bonuses depending on Temasek achieving more than a hurdle rate of return, which is pegged to the cost of 10-year debt according to the Temasek annual report. The report discloses that staff may get co-investment grants in which they share directly in Temasek’s returns. If Temasek succeeded in acquiring CAG this could then result in a massive bonus for Ho Ching and her management team. If she was to get even 1% of the value accretion from floating CAG this could potentially be worth up to $500 million at some point in the future. This is all pure speculation since Singaporeans are not told how much Ho Ching is paid or how her remuneration is calculated. No one in Parliament has asked about her or her team’s remuneration. When questions were asked in Parliament about Chip Goodyear’s resignation and his leaving package Tharman was evasive and rebuffed questions with “People do want to know. There’s curiosity. But that is not sufficient reason to disclose information.” and “It will not be advisable, nor in the interest of Temasek or Mr. Goodyear, for us to comment further. It serves no strategic purpose.” It is incredible that the PAP Government were able to get away with this reply and with not disclosing Ho Ching’s remuneration given that Singaporeans own the assets and the managers who run them are public servants. Even if CAG is not sold to Temasek at a knock-down price, we need to be vigilant against any other attempts to transfer value from the taxpayer to the management of CAG or a new purchaser. At some future point the Government may decide to put in place a poison pill triggering its sale on a change of government, rather like the PAP did with AIM. The management could decide to form their own company and acquire the assets themselves, or in partnership with a private equity firm, at a significant undervaluation, particularly if no one in Parliament is aware of or prepared to question their true value. This is not just a theoretical possibility. It actually happened with state assets that were sold off after the collapse of the Soviet regime. Similarly Nomura’s private equity group in the UK were able to purchase the Ministry of Defence’s surplus housing stock at a fraction of its true worth in the 1990s and make reported profits of US$1.9 billion. We need full disclosure from the PAP Government on how it accounts for enormously valuable but apparently unrecognised assets like CAG and the value it assigns to them. We need to ensure that the taxpayer reaps the full financial vale of these assets particularly if she is asked to add value by paying for investments. Finally safeguards need to be put in place that the civil servants running these businesses do not enrich themselves at the public’s expense in the event of a sale and in particular that any sale, even to Temasek, takes place at full open market value. This is particularly important given the inside information possessed by the management and the PAP’s preference for secrecy. Given the close connection between Temasek and CAG and the dual roles played by many of the directors of CAG, Temasek will have insider information and an edge even if there is an auction. We have to ensure that the management of Temasek, including Ho Ching, do not reap a windfall profit because of this insider knowledge. Perspiration without Inspiration. Singapore’s Role in the Asian Economic Boom. The report has raised some very valid concerns and it is incumbent on every Singaporean to ensure that we get full and transparent accounting regarding the said matter from the PAP. Very good analysis of the current position and the likely future outcome of CAG if left unchecked. Hope more and more Singaporeans will become aware of the convoluted schemes of the PAP. Hope the people will vote you into Parliament and may your Party garner strength to counter-balance the PAP. There is only one simple advice we can give to Singaporeans – they have been taken for a ride for decades. But in recent years, more and more have woken up, and realized how little the govt has done for them, for years. And they are yearning for a change, plausibly the exit of the PAP as the governing party. The PAP has long ceased to be a trustworthy party; it is time to see the citizens taking back the power they have conferred on it.